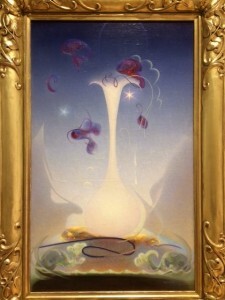 Image: “Memory,” oil painting by Agnes Pelton, 1937, photographed by author at the Palm Springs Art Museum. Cancer is a sign of deep memory and impressions. Doesn’t this image also evoke a new year’s celebratory flute of champagne? A Super Full Moon begins a New Year! What an encouraging augur! A super Full Moon looks larger, since it is closer to Earth. Can you FEEL its tidal pull? And we’ll get another Super Full—and Blue—Moon at the end of this month. What a way to start a year! Cancer often has a particularly deep memory, hence the graphic above. What do you want to remember about 2017 and bring forward into 2018? What about any business you have initiated and want to continue to grow? Review the plan and move along with care. No time to waste. No haste, no waste. Old tried and true mottos come to mind in traditional Capricorn. The January 1 calendar new year is always in the practical earth sign Capricorn, ruled by Saturn, Lord of Time. Saturn has just stepped authoritatively into Capricorn, its own sign, signaling a get-down-to-business agenda for this New Year. “Let’s get real, down-to-the ground,” says Saturn. It’s not NOT busy-ness or business as usual—no! Capricorn is one of the “cardinal” signs, creative, innovative, active on the front lines. Saturn in Capricorn is about plans and outlines, basic design, solid and sacred geometry, earth-honoring protocols, good use of time, energy and all other resources. Not just Saturn, but Black Moon Lilith, Venus and Pluto stand close to the Sun, opposing the Moon, and coloring the New Year with special hues of deep goddess power. Venus, so close to the Sun, has disappeared into its light, about to conjunct the Sun on January 8-9—with Pluto!! The deep, dark goddess of transformation is on the loose this year—Glory be!— working from behind the scenes to begin with. This conjunction takes place at 19 degrees Capricorn on the far side of the Sun. Venus is as far from us and as close to the stars as she can reach. We won’t see her for many weeks. The cycle of Venus in relation to the Sun and Earth is highly aesthetic and emotionally meaningful, reverberating with regular moments every four years in the Venus cycle. Can you remember anything significant about January 2010 or 2014? Mark January 2022 on your calendar for future reference. In 1993, we had a rare conjunction of Uranus-Neptune at 19 Capricorn, impacting a whole generation. What was going for you at that time? Take special note of this January 23, when Mercury reaches this degree and puts out some big news. Saturn reaches 19 Capricorn in spring 2019 and goes on to join Pluto in January 2020 to draw a clear line in the sand. Take stock of these times in relation to what is going on now. Venus in Capricorn matures like fine wine or a healthy investment over time. Re-evaluate your plans in relation to your evolving values, emotional intelligence and experience. Based on what unfolds, make room in your mind for a Plan B and C. Ask advice from older women in your life, who have experienced a thing or two along their way that might be worth listening to. The subtle presence of Black Moon Lilith in Capricorn adds evocative nuance to already deep Venusian harmonies. No symphony sounds a full story and range without dissonant chords of transition and transcendence into fulfilling, full-feeling harmonic resolution. Lilith in Capricorn is very deep-earthy, ancient and as resilient as Avebury/ Stonehenge standing stones. She is out to “blow your mind” open to soul-centered wisdom. Our thinking minds are the dumbest part of consciousness, largely conditioned by our limiting ego. Take your moments of questioning, angst, discomfort and dissonance in this spirit, listening deep into to heart and soul for meaning and fine-tuning, and see how it all resolves for you. Moon in Cancer is tender, caring and private. Heal or let go of memories that interfere with your wellbeing. Focus on the good news in your personal world rather than the disturbing public news spinners. Mars in its own sign of Scorpio joins Jupiter to give lots of energy, drive and resolve, passion and intensity to move things forward, to keep our plans going. This combo is like a locomotive that leaves the station slowly, gathering speed and sustaining a long run toward accomplishments. Neptune in its own sign of Pisces, along with Chiron. Practice self-compassion and kindness toward others. Tuning into our feelings helps us stay grounded in our bodies. No rationalizing, just be wary of taking things too subjectively and personally. Contemplate, consider, go back over things to stay in touch with yourself. Ceres/North Node in Leo—a generous heart filled with love for all brings joy to the world. There are so many special things about this New Year’s Super Full Moon. Let’s each apply our creative energies to make our year live up to it! Let’s listen to the deep heart beat of the Earth to guide our way, as planet Earth, herself, responds to rare, complex and multidimensional cosmic influences. Life is as it is, spacious, precious and divine. Let’s live it to the Full (Moon)!